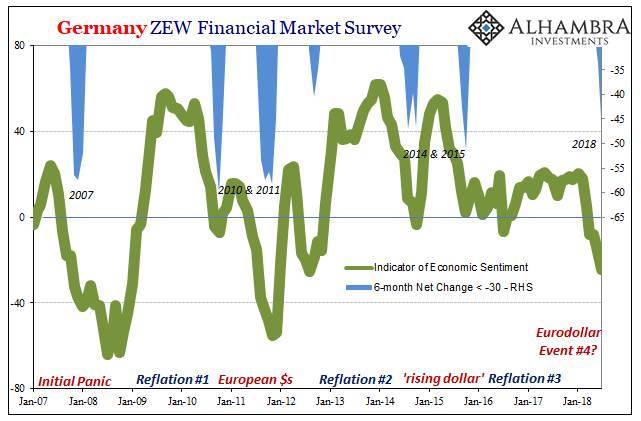 Like all sentiment surveys, Germany’s ZEW is susceptible to overzealousness on the part of the survey participants. The Zentrum für Europäische Wirtschaftsforschung is a think tank located in Manheim that has since 1991 carried out this broad questionnaire. Up to 350 analysts are included in the panel, each working at a bank, insurance carrier, or major industrial firm located in the country. Each panelist is asked to consider business cycle type questions about a range of economic and financial topics. These are not limited to just conditions in Germany, either, though the purpose is to better understand the German economy. Being an export powerhouse, Germany’s economic direction is as much determined outside of its borders as inside. Because the profile is developed from essentially Economists, its use is somewhat limited – very much like other sentiment surveys. We tend to notice it when there are extremes (in either direction) or when something changes. Unlike the rhetoric about Europe’s economy and Germany’s place in it, the ZEW has not really registered all that much positivity over the past few years (keeping closer to actual GDP instead of the overheated commentary surrounding it). Maybe Economists aren’t all bad at least in the aggregate (pun intended). Instead, what demands notice of their Indicator of Economic Sentiment is its large collapse since January. In the latest value for July 2017, reported today, the index has dropped to -24.7, down from -16.1 in June and -8.2 in May. It’s the lowest since 2012, not a particularly auspicious comparison. To begin this year, the value was +20.4.  That means over the subsequent six months, this specific half year that has followed noteworthy, serious worldwide market liquidations, the index has tanked by an alarming 45.1 points. The current survey period has been marked by great political uncertainty. In particular, fears over an escalation of the international trade war with the United States have dampened the economic outlook. The positive news regarding industrial production, incoming orders and the labour market have been greatly overshadowed by the anticipated negative effects on foreign trade. Achim Wambach’s words as President of the think tank have been reprinted verbatim all over the Western media. Seriously, google his statement and you’ll find it in almost every news article written today about the Economic Indicator’s serious drop. Blame Trump. I’m not suggesting there is some sort of conspiracy, political or otherwise, rather the reason is far simpler. Nobody really knows what to make of this, so they resort to all sorts of plausible sounding fallacies. The economy is booming, they all say, so this can’t be anything other than something unusual. What else could it be? Professor Wambach provides the fodder with a gloss of his pedigree and the “reasoning” is repeated all over the place as if it has to be true. No, the current decline isn’t something new at all. Those of similar scale have appeared at almost regular and recognizable intervals (above). Taken by itself, it’s another soft economic warning that we should take serious the prospects beyond just the latest false dawn (globally synchronized growth). 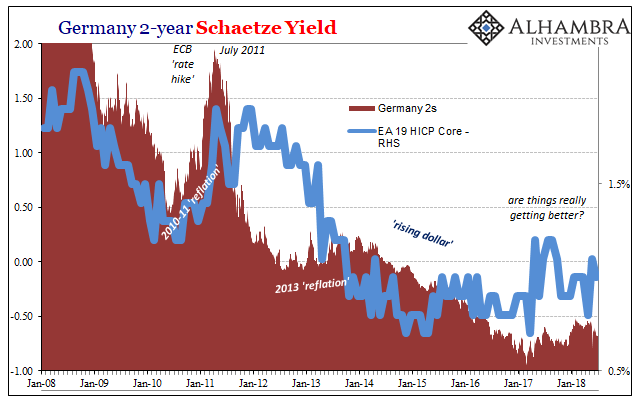 Like the narrow upswing of the ZEW index itself, what’s suggested is that whatever little growth there might have been during Reflation #3 it may have since disappeared; the unpleasant scenario of the global economy having already started rolling over. The ZEW, however, is not alone in its implications. Germany’s bund market has, too, found renewed pessimism. 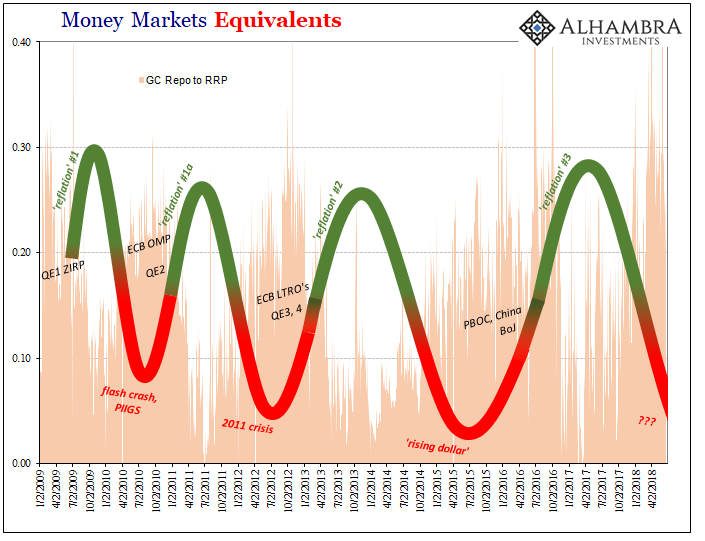 This was at an extreme on May 29 in what was surely a European-based global collateral call, one that reminded us of October 15, 2014. 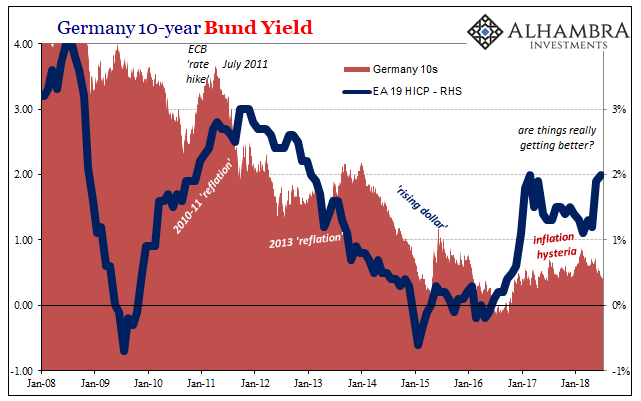 It impacted the UST market but whose epicenter was certainly German federal bond collateral. 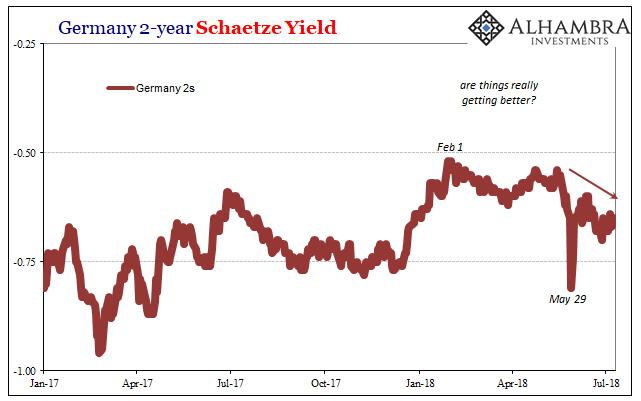 Over the six weeks since, though the 2s (schaetze’s) had rebounded from that day they are still leaking lower back toward levels more consistent with the “bad” days in 2017 before Europe’s boom was widely heralded. 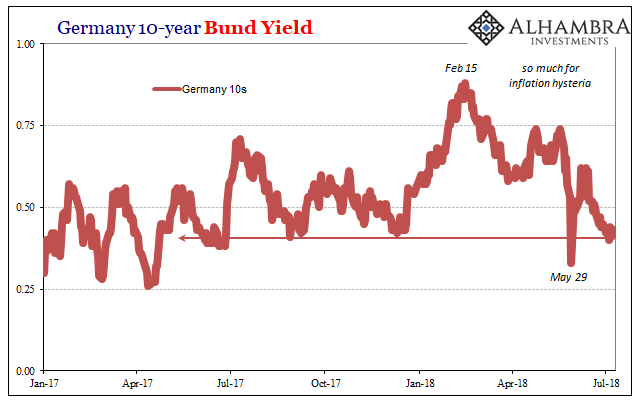 But that’s nothing compared to the 10s (bunds) where yields are nearly back to May 29 levels already. Remember, this data is gleaned from interpretations of economic conditions on a broadly global scale but directed toward Germany. These are not sentiments about Europe’s economy as a whole, with its lagging Southern half still mercilessly attached by the euro (and eurodollar, for that matter) potentially dragging down a truly robust machine. This is Deutschland, the engine of whatever growth Europe hopes to be able to ever achieve. Or not. Like Japanese indications, also timed to the same post-January period in question, these are more corroborated figures that suggest a very different global trajectory developing than the one Jerome Powell will almost surely cluelessly adhere to no matter what. And it’s not the Fed that is at the cause of this renewing mess, either. It’s yet more evidence of the growing forecast error, one that applies to much more than the Federal Reserve’s blind stabbing “rate hikes.” One important curve has already inverted. I suspect it might not remain alone in that state for very long.